Each Friday, the another jennifer blog shares stories of those who incorporate philanthropy into their everyday lives – personally and professionally – in a creative and unique way. If you have a story you’d like to share, please contact Jennifer. You can view past posts from the series here. A baby tree planted by Trees for a Change. 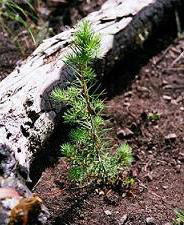 Trees for a Change is an organization that dedicates trees as gifts in U.S. National Forests that have been destroyed by wildfire. The company was founded about six years ago when Kim Isley became sick of all the “stuff” that was being promoted as gifts around the holidays. Kim wanted to do something that focused on making things better, not just producing more products that would eventually end up in a landfill. Kim, founder and “tree lover-in-chief” at Trees for a Change, had read over and over again that planting a tree is one of the best things you can do for the planet. Kim started Trees for a Change as a way for people to change the way they think about giving gifts. You can read more of Kim’s story and the company’s values here. Trees for a Change plants trees for many occasions, including birthdays, weddings, holidays, fundraisers and even pet memorials. In fact, as Kim and I exchanged emails about her company, she read my post about saying goodbye to Kona and offered to plant a tree in his name. When you purchase a tree as a gift for someone, a certificate is created with his or her name on it. You can even find your tree on the website and see where it was planted and how it will help the environment. They work directly with the U.S. National Forest Service to plant the trees. Kona’s certificate. You can see his photo on the pet memorial page. 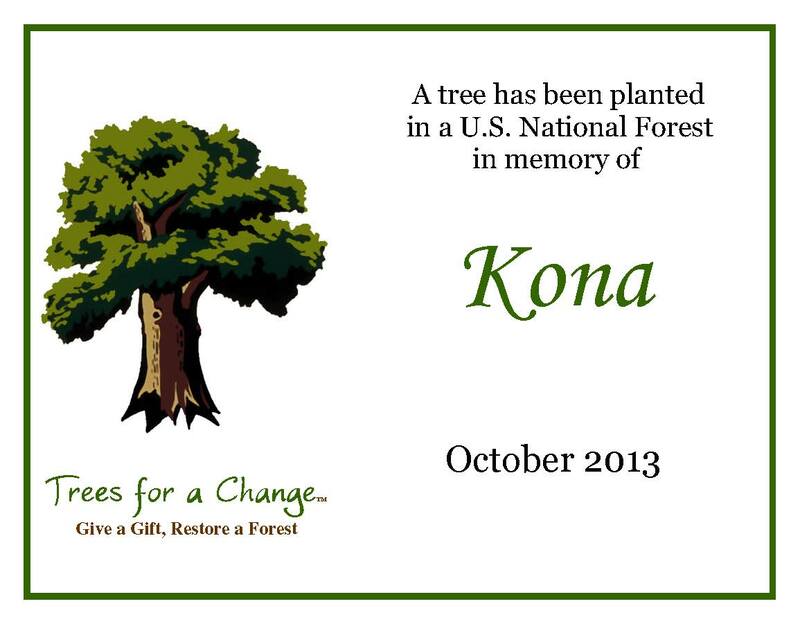 Kona’s tree, a longleaf pine, will be planted in the Blackwater River State Forest in the Florida Panhandle region. To date, almost 10,000 trees have been planted by Trees for a Change in five different forests. Kim’s favorite part of her job is visiting the baby trees right after they are planted and taking photos. With options as low as $15, Trees for a Change can help you find an affordable and unique gift that will also restore a forest. Not a bad deal. Will you give a tree as a gift this holiday season? Love this idea. I have bought trees in Israel for people my entire life. I think it’s great that you can do this in t he US and help restore one of our national forests. Great work as always, Jen! That’s awesome, Ilene. I love how they are partnered with the US National Forest so you know the trees are planted where they are truly needed. Ahh, so sweet, the Kona tree! I am a tree hugger myself. SOmething tells me someone is getting a tree for Christmas this year! I think that’s a great idea, Lisa. That way you really feel like you are honoring your lost pet in a way that will help the environment. Win-win! This is so cool! As Ilene mentioned, I remember a relative buying a tree for me out in Israel. l like to think about it. What an awesome idea. I want to buy Cassidy a tree in Alaska! I’m going to have to investigate if that is on their list of places they do this..
Tamara recently posted..PinkWhen Jen and I! I’m not sure if you get to choose the location. I think it just goes by where the US National Forest is restoring trees next. How cool if you could plant one in Alaska though! You find the best companies for Philanthropy Friday. I love this idea! I got into photography a while back and trees were my favorite thing to capture, with or without the leaves. The way the branches form in all sorts of variety are truly beautiful. I used to lay under trees and take a million pictures. Trees are just amazing, aren’t they? I’m also a sucker for good tree photography. I kind of like the ones without leaves. My pleasure, Kim. I’m so glad you reached out to me. And I am truly thankful for the tree you’ve planted for Kona. It really means a lot! Wow, what a purposeful gift! Great company! I agree, Joi. It’s a great business model. Oooh I like this one – simple, but meaningful! Will def be checking them out – thanks! My pleasure, Charmaine. It’s a great company! This is great! I would def give a tree as a gift. My family and I are nature lovers and I know they would love the idea too! 🙂 Great post! Thanks, Diana. This is the perfect gift for a nature lover! I love this concept. I’ve been known to donate to Arbor Day and have trees planted in my family members’ names at Christmas. This is awesome, too! I just love your ideas about giving back – seriously! And…grrr…Akismet has been sending some of my regular commenters to spam. I found one of yours and perhaps that’s why some of them have been disappearing. I don’t always check the spam folder. Dang. Ah, technology. Trees for a Change sounds perfect for you, Cyndi! I get so many spam comments that I fear I miss some of mine as well. I try to check, but it’s hard to keep up! What a BRILLIANT idea!!! I love her perspective behind this idea- gotta share! Thanks, Chris. I was inspired by Kim’s passion for what she does. anotherjennifer recently posted..Flush for Good: Celebrating World Toilet Day with Awareness and a Giveaway!